Objective: To explore the feasibility and treatment strategy of application of single-staged endovascular embolization combined surgical resection for complex cerebral arteriovenous malformations (AVM). Methods: The clinical data of 11 cases of patients with complex cerebral AVM treated by single staged endovascular embolization combined surgical resection were analyzed. AVM was graded using the Spetzler-Martin grading system. The preoperative neurological score was rated according to the Glasgow Coma Scale (GCS) scoring system. The postoperative images were obtained by DSA or enhanced CT and CTA. The clinical follow-up was conducted by a modified Rankin scale. Results: The clinical data of a total of 11 patients were collected. Eight patients were scored 15 by the preoperative GCS, one patient 13, one patient 11, and one patient 6. Four patients were graded 2 by the Spetzler-Martin grading system, three patients 3, three patients 4, and one patient 5. Intraoperative angiography confirmed that the immediate imaging cure rate reached 100%, of which AVM residue was found in 3 cases in the intraoperative angiography. After one-stage re-resection, it was confirmed that malformations were completely not developed. Postoperative re-bleeding was not found in any cases. All patients were followed up. After 3-month follow-up, nine persons were scored 0 by the modified Rankin scale, and two persons were scored 2. Eight persons received postoperative radiology follow-up, two received CTA, and six received DSA. There was no recurrence. Conclusion: The hybrid operation of single-staged endovascular embolization combined surgical resection has improved the treatment of complex AVM, reduced the difficulty of treatment and improved the effectiveness and safety of the treatment. Cerebral arteriovenous malformations, Hybrid operation, Endovascular embolization, Surgical resection, Single-staged hybrid operation. Complex cerebral arteriovenous malformations (AVM) are a series of congenital local cerebrovascular alteration. Some scholars defined them as cerebral arteriovenous malformations of large size (malformation group may be up to about 6 cm in length) combined with aneurysm and cerebral vascular occlusion involving functional areas, deep brain, and multivessel blood supply . The higher the Spetzler-Martine AVM grade (S-M grade) is, the greater the risk of the treatment will be [2,3]. For S-M grade I or II cerebral AVM in nonfunctional area, surgical resection, endovascular embolization or radiotherapy can achieve satisfactory treatment results [2,4]; but for S-M grade II AVM involving the functional areas or SM grade III or above AVM, the risk of treatment significantly increases. In the 2001 edition of Guidance to treatment of Cerebral Arteriovenous Malformations issued by the Stroke Council of the American Stroke Association (ASA), it was recommended that endovascular embolization was first adopted for grade III cases and then followed by surgical resection; and if the deformed blood vessels were in the brain function area and the risk of direct surgical resection was great, it was recommended to consider radiotherapy; for grade IV and V cases, due to the huge risk of treatment, it was not a recommended treatment . For large AVM, multiple treatment were performed in the previous cases; first one or more endovascular embolizations were performed, and then the residual AVM was resected 1 to 3 weeks after endovascular embolization; the biggest risk lied in residual AVM bleeding at operation interval. And for the AVM located in the functional area, the stereotactic radiotherapy or observation was often adopted. According to Schaller et al, the neurological damage rate after high grade AVM surgical resection reached 30% to 47% . Han et al. concluded that the risk of re-bleeding after grade IV and V treatment was significantly higher than that in no treatment (10.4% vs. 1.5%) . In order to further optimize the treatment of complex AVM, in recent years, hybrid operation has been gradually explored and applied in the treatment of complex cerebrovascular diseases [7-9], which is expected to change the treatment of some complex AVM. The hybrid operating room allows the singlestaged combination of original independent intravascular intervention with the microsurgery in the same sterile environment without changing the patient's position . The intraoperative angiography can discover residual AVM lesions timely, so as to effectively prevent the occurrence of postoperative re-bleeding, and locate small or deep AVM lesions . Our center from 2013 established a hybrid operating room and carried out hybrid operation for complex cerebrovascular diseases, especially for large AVM, using a one-time resection strategy. For AVM involving the functional area, we performed accurate treatment after accurate judgment of brain function under the electrophysiological monitoring, and achieved satisfactory results. Therefore, our current research will explore the feasibility and treatment strategies of application of hybrid operation in accurate treatment of complex brain AVM combined with specific cases. Relevant clinical data of the patients with complex brain AVM who received hybrid operation of single-staged endovascular embolization+microsurgical resection in our hospital from May 2014 to June 2017 were collected, including age, gender, AVM location, Spetzler-Martin grade, and preoperative neurological score, which were rated according to the Glasgow Coma Scale (GCS) scoring system. The following inclusion criteria were used: the brain arteriovenous malformation had to be untreated and the nidus had to measure ≥ 3 cm in size to maximize the possibility that arterial steal physiology may be occurring due to high flow shunting through the large nidus. Seizure patients with a prior history of brain haemorrhage were not enrolled, to exclude patients with seizure activity unrelated to haemodynamic factors, such as prior cortical scarring or gliosis. All cases received single-staged endovascular embolization +surgical resection. All cases routinely received intraoperative neurophysiological monitoring. For the AVM of large size, vascular embolization was performed to reduce and limit the malformations to the greatest extent; embolization was firstly performed from the deep arterial artery, and then followed by surgical removal of residual AVM. For the AVM involving the brain function area, the propofol injection test was performed before the treatment of the embolization of the arterial artery. The judgment basis of brain sensory and eloquent cortex were the 50/10 rule of somatosensory evoked potential (SEP), i.e., the response amplitude >50% and/or the latency >10% were taken as the alarm criteria [11,12], and "All Or None" was taken as the alarm criteria of the cerebral cortex evoked muscle potential. If the alarm criteria was exceeded or reached, embolization was not performed from the vessel. The judgment basis of the visual function area was the field of vision in the awake state. All cases underwent intraoperative angiography immediately after surgical resection to determine whether there was residual AVM. In case of one-stage residual, a surgical resection was performed. At the end of the operation, intraoperative CT examinations were performed . All patients underwent head CT examination, MR examination and DSA examination before operation (Siemens Artis zeego). All patients were scored by the modified Rankin scale after 3- month follow-up. The cerebrovascular review 3 months after operation preferred DSA examination. Clinical data of 11 patients who received hybrid operation of single-staged endovascular embolization combined with microsurgical resection were collected. Nine males and two females were included, with an average of 33.9 years old. Four cases of the malformations were located in occipital lobe. Two cases in frontal lobe, two cases in temporal lobe, one case in temporal occipital lobe, one case in parieto-occipital, one case in parietal lobe, and one case of malformations combined with aneurysm. Eight patients were scored 15 by the preoperative GCS, one patient 13, one patient 11, and one patient 6. Four patients were graded 2 by the Spetzler-Martin grading system, three patients 3, three patients 4, and one patient 5 (Table 1). Table 1. Characteristics of 11 patients with AVM and outcome. All 11 cases underwent successful single-staged AVM embolization + resection surgery. Intraoperative angiography confirmed that immediate imaging cure rate reached 100%, of which, AVM residue was found in 3 cases of intraoperative angiography; after one-staged surgical resection, no AVM residue was found in the intraoperative angiography again. Rebleeding did not occur in the perioperative or follow-up periods in all cases. In this group, two patients (cases 2, 3) underwent the super-selective propofol injection test for feeding artery while their somatosensory evoked potentials and motion evoked potentials were monitored; after the test was confirmed safe, embolization was performed. One patient (case 11) involving the occipital cortex area received embolization after confirmed to be safe. The three patients did not show interventional embolism related neurological dysfunction. Except one patient involving the left occipital large AVM (case 7) showed right visual field loss after operation due to the visual cortex area cannot be protected based on preoperative judgment, the remaining patients did not have complications (Table 1). All patients received clinical follow-up after operation. The modified Rankin scale 3 months after operation: Nine persons were scored 0 and two persons 2. The AVM in two cases of patients involved the visual cortex area; 1 case involved contralateral visual field hemianopia; 1 case did not involve obvious visual field loss. Eight persons received imaging review, two received CTA, and six received DSA. There was no recurrence (Table 1). Case 11: male, 24 years old, sudden syncope with headache, left side 1/4 outside visual field loss, diagnosed as AVM in the right occipital lobe and lateral ventricle occipital area, Spetzler- Martine grade IV. The upper of the malformation group involved the cortical cortex of fissura calcarina; therefore, it was preferred to embolize the deformed blood vessels at the site, reduce and limit the malformations from the peripheral embolization, and finally resect the residual deformed vessels. The postoperative visual field loss was the same as preoperative; he was scored 0 by the modified Rankin scale when discharged (Figure 1). Figure 1: Patient, male, 24 years old, syncope 2 times with headache for 3 months, diagnosed as right occipital AVM, Spetzler-Martine grade IV. A, B: preoperative MR, which showed that malformations were located in the occipital lobe, involving the occipital angle of the right lateral ventricle, and showing an inner branch travelling to the fissura calcarina; C, D: DSA angiography of preoperative right vertebral artery at adem position; E: Small amount of malformation groups after embolization; F, G: Intraoperative angiography showed that malformations were not developed after resection; H: postoperative CT showed no bleeding, malformations with partial embolization were not resected. Case 7: Male, 5 years old, headache 3 months, with violent headache, accompanied by nausea and vomiting, diagnosed as AVM at rigth parieto-occipital, Spetzler-Martine grade V. It was preferred to embolize the AVM in the posterior cerebral artery blood supply area by interventional therapy, reduce and localize the AVM by interventional embolization, and finally resect the residual malformations, achieving single-staged cure (Figure 2). The left visual field was lost after operation. He was scored 1 by the Modified Rankin scale in the follow up. Figure 2: Child patient, male, 5 years old, headache 3 months, Spetzler-Martine grade 5. A, B: MRI showed the giant AVM at right occipital lobe; C: The angiography 3D fusion images of right internal carotid artery and right vertebral artery showed the AVM; D: Residual malformations after embolization; E: Morphology of embolized Onyx glue; F: Residual AVM was found in the intraoperative angiography after surgery; G: The second angiography after simultaneous resection showed no AVM development; H: Resected deformed vascular tissues. About 50% of AVM patients will bleed , and the rebleeding rate in the first year after first bleeding reaches 6%-10% [14,15]. Therefore, the bleeding AVM should receive active treatment. However, for the patients with repeated headache to the severe extent, we believe that treatment should also be recommended. However, treatment of arteriovenous malformations has a variety of treatment strategies . There are still exists challenges to the treatment of complex AVM involving functional areas or at Spetzler-Martine grade III and advanced grade . In this part, we discuss the strategy of hybrid operation in treatment of complex AVM combined with specific cases. Case 11 was diagnosed as the AVM at right occipital lobe and in the lateral ventricle occipital area. The upper side of the lesions involved the gyri at the right fissura calcarina. The malformations at the largest layer were 45 mm in diameter, and in the deep location. Therefore, we prepared the surgical program: embolization of deformed blood vessels involving the gyri at the fissura calcarina+maximization of the embolization of deformed blood vessels+resection of residual deformed blood vessels+intraoperative angiography. Before the embolization of the malformations in the visual functional area, the propofol injection test was performed to the feeding artery to be embolized when the patient was in the awake state. The results suggested that vision or visual field was not significantly affected. Therefore, the embolization of the deformed vessels in the area was performed under general anesthesia (Figure 2B). The malformation groups at the inner right side were treated by interventional embolization as far as possible. Since AVM's blood supply comes mainly from the deep posterior cerebral artery, we embolized the branch of the artery and reduced and limited the malformations as much as possible. During removal of the malformations, the malformation groups that have been completely embolized were not resected too much, especially when the functional area was involved, to protect brain functions. Intraoperative angiography showed that malformations were not developed, postoperative vision and visual field examinations were similar to preoperative ones, no new vision loss occurred. Therefore, after accurate judgment of brain functions, the implementation of hybrid operation will benefit patients. However, because our hospital is still lack of intraoperative visual electrophysiological monitoring equipment, no corresponding electrophysiological monitoring was carried out in the operation. For larger-sized AVM, the risk of single treatment is high for both embolization and surgical resection [2,7]. Forty-month occlusion rate of gamma knife for the large-sized AVM is relatively low, the complete occlusion rate when AVM is greater than 15 cm3 is only 25% , and there is the possibility of bleeding during the occlusion process. Case 7 was a 5-year-old child, due to up to 3-month repeated severe headache, he came to our hospital. The AVM volume of the patient was bigger than 6 cm. Only a small amount of embolization was performed to the blood supply branch of the external carotid artery in other hospital, and his symptoms were not improved. After communicating with the patient guardian, we implemented a single-staged radical hybrid operation for the child. Surgical program: Maximization of the embolization of deformed blood vessels+embolization of the deep feeding artery+resection of residual deformed blood vessels+intraoperative angiography. In the single-staged surgical conditions, the patient under general anesthesia in the entire treatment was conducive to accurately controlling blood pressure and other indicators. We believed that this allowed maximization of the embolization of malformations, which was different from the previous concept of staged embolization; however, what was the same was that it was also preferred to embolize the deep feeding artery or ruptured blood vessels and nested aneurysms not easy to reach in the operation . We also agreed with the opinions of Weber et al. To reduce the risk of bleeding during surgery, intravascular embolization of the large feeding artery in the brain AVM was performed prior to surgical resection of AVM . In addition, for large AVM, one of the purposes of embolization is also to limit the malformations, which is conducive to resecting residual malformations. However, we wondered whether normal perfusion pressure breakthrough (NPPB) phenomenon will appear in a one-time radical treatment of large AVM , which may lead to postoperative cerebral edema or cerebral hemorrhage. From our cases, such phenomena did not occur. The theory is mainly based on the results of murine trials, which is not confirmed in human trials or medical practice. With advances in neuroimaging, cerebral blood flow, and cerebral perfusion measurements over the last three decades, the NPPB theory has still not been confirmed . Some scholars believe that the cause of postoperative bleeding may be the bleeding of residual malformations. Because intraoperative angiography was not possible in the past, whether the malformations have been completely ruled out cannot be determined. However, from our initial experience, under the combined surgical conditions, one-time complete resection of AVM did not lead to NPPB phenomenon, which also supported the above point of view. In this group, 3 cases of intraoperative angiography found a small amount of residual malformations, which received single-staged resection, reducing the possibility of postoperative bleeding and avoiding the re-treatment. There was no NPPB phenomenon in our patients during perioperative period. Single-staged hybrid operation may maximize the advantages of intravascular embolization combined with surgical resection, which can reduce the difficulty of treatment of complex AVM and improve the safety and efficacy of the treatment of such diseases. Yongli Z, Xiangen S, Yuming S. Treatment strategy and microsurgical treatment of complicated cerebral arteriovenous malformations. Chinese J Surg 2011; 49: 1017-1021. Ogilvy CS, Stieg PE, Awad I. AHA scientific statement: recommendations for the management of intracranial arteriovenous malformations: a statement for healthcare professionals from a special writing group of the Stroke Council, American Stroke Association. Stroke 2001; 32: 1458-1471. Spetzler RF, Martin NA. A proposed grading system for arteriovenous malformations. J Neurosurg 1986; 65: 476-483. Potts MB, Lau D, Abla AA. Current surgical results with low-grade brain arteriovenous malformations. J Neurosurg 2015; 122: 912-920. 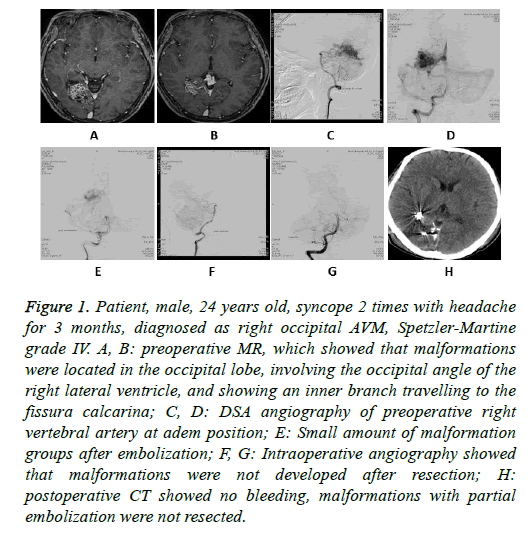 Schaller C, Schramm J, Haun D. Significance of factors contributingto surgical complications and to late outcome after elective surgery of cerebral arteriovenous malformations. J Neurol Neurosurg Psychiatry 1998; 65: 547-554. Han PP, Ponce FA, Spetzler RF. Intention-to-treat analysis of Spetzler-Martin grades IV and V arteriovenous malformations: natural history and treatment paradigm. J Neurosurg 2003; 98: 3-7. Fandino J, Taussky P, Marbacher S. The concept of a hybid operating room: applications in cerebrovascular surgery. Acta Neurochir Suppl 2013; 115: 113-117. Jinjun T, Zhizhong L, Jinning Z. Application of hybrid surgery room microsurgery combined with vascular intervention in the treatment of complex cerebral arteriovenous malformations. 2014; 94: 3763-3766. Murayama Y, Arakawa H, Ishibashi T. Combined surgical and endovascular treatment of comples cerebrovascular diseases in the hybrid operating room. J Neurointerv Surg 2013; 5: 489-493. Ge Y, Jizong Z, Shuo W. Application of intraoperative angiography in cerebral arteriovenous surgery. J Peking Univ 2007; 39: 412-415. Levy WJ, Gugino KV, Ghaly R, Draugn L, O’Mahoey T. Electrophysiological monitoring: Spinal surgery: In: Intraoperative Neuroprotection. Williams & Wilkins, Baltimord 1996. Owen JH. Evoked potential monitoring during spinal surgery: In: The Textbook of Spinal Surgery. Lippincott, Philladelphia 1999. Cohen D, Cuffin BN. Developing a more focal magnetic stimulator. Part I: Some basic principles. J Clin Neurophysiol 1991; 8: 102-111. Kim H, Sidney S, Mcculloch CE. Racial/ethnic differences in longitudinal risk of intracranial hemorrhage in brain arteriovenous malformation patients. Stroke 2007; 38: 2430-2437.
da Costa L, Wallace MC, Ter Brugge KG. The natural history and predictive features of hemorrhage from brain arteriovenous malformations. Stroke 2009; 40: 100-105. Lv X, Wu Z, He H, Ge H, Li Y. Proposal of classification of aneurysms coexisting with AVM and possible treatment strategies. Turk Neurosurg 2016; 26: 229-233. Pan DH, Guo WY, Chung WY, Shiau CY, Chang YC, Wang LW. Gamma knife Radiosurgery as a single treatment modality for large cerebral arteriovenous malformations. J Neurosurg 2000; 93: 113-119. Kalani MY, Albuquerque FC, Fiorella D. Endovascular treatment of cerebral arteriovenous malformations. Neuroimag Clin N Am 2013; 23: 605-624. Weber W, Kis B, Siekmann R. Preoperative embolization of intracranial artenovenous Malformations with Onyx. Neurosurgery 2007; 61: 244-252. Spetzler RF, Wilson CB, Weinstein P. Normal perfusion pressure breakthrough theory. Clin Neurosurg 1978; 25: 651-672. Rangel-Castilla L, Spetzler RF, Nakaji P. Normal perfusion pressure breakthrough theory: a reappraisal after 35 years. Neurosurg Rev 2015; 38: 399-404.